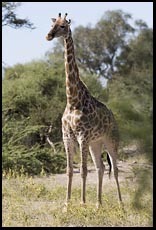 Botswana has a climate similar to Southern California's and a density of wild animals similar to the San Diego Wild Animal Park. 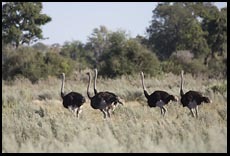 This makes it one of the world's most pleasant places to be a wildlife photographer. 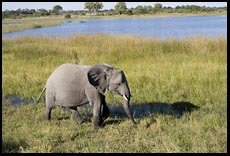 Botswana's big attraction is the Okavango Delta. 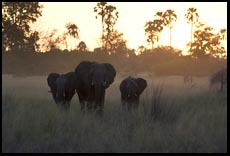 Unlike other African countries where animals migrate to follow the water, the Okavango is wet year-round and therefore has animals year-round. Where does the water come from? In the wet season, November through March, it falls from the sky. 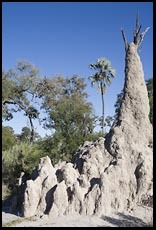 In the dry season, it arrives in the form of a flood from a river rising in Angola. 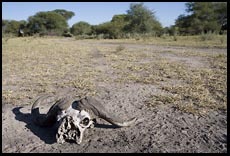 The part of Botswana that doesn't get flooded by the Okavango is very dry indeed. 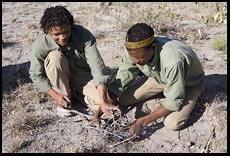 Most of it is the "Kalahari semi-desert" and thinly populated with animals or humans. The best time of year is the dry season: April through October. 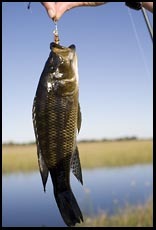 June through September seems to be a favorite, and animals are more concentrated at rivers and other water sources. 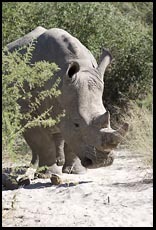 If you don't like the cold, be aware that a pre-sunrise game drive in July or August (Southern Hemisphere winter) will be very cold indeed. The high-end lodges will supply wind-proof ponchos and hot water bottles, but you're driving around in an open vehicle in near-freezing temperatures. 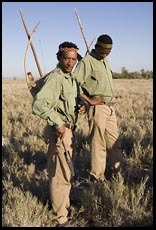 The cities of Botswana are pleasant and relaxed by African standards, but for the visiting photographer are most likely to be transit hubs rather than destinations. 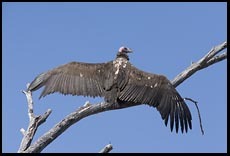 You will probably fly into Maun, adjacent to the Okavango Delta, and immediately fly out on an air taxi. 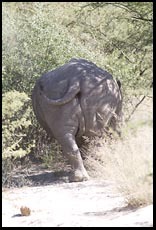 South Africa is a country where Democrats would feel right at home. They celebrate gay marriage. Applicants for a job are sorted by skin color before their skills are evaluated, in affirmative action programs that favor the dark. When you ask folks why there are so many carjackings and armed robberies, they say the criminals didnt get enough love during apartheid or "We need to create more jobs". 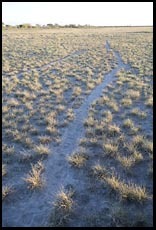 National parks are accessible by paved roads and open to all for a modest fee. 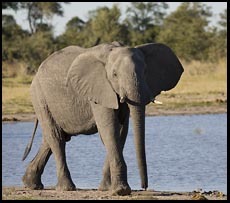 Botswana, on the other hand, is for Republicans. 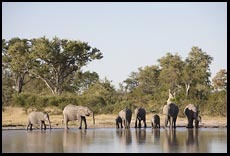 Areas of natural beauty and abundant wildlife are leased to private tour companies who are allowed to build lodges with no more than 7 or 8 rooms (tents). 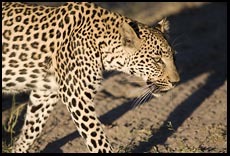 The result is that only people who can afford $1000 or $2000 per night per room will see the lions, leopards, and rhinos. 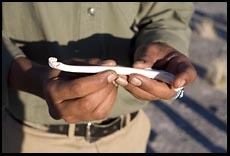 Affirmative action is unknown and job applicants, white or black, are evaluated on the basis of their ability to work. 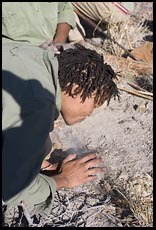 Thieves are imprisoned, often after being beaten unconscious by enraged citizens. 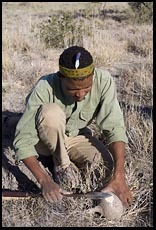 Finally, the Botswanans love diamonds, discovered in 1967, one year after independence, and are now the world's leading producer of gem-quality stones. 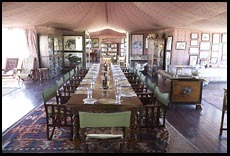 On the edge of the Kalahari, and lacking the Big Five, Jack's Camp is a great place to start or end an Africa trip. 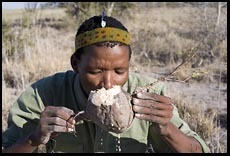 The level of luxury here is not very high compared to the newer "less African" camps, so it might not be the best choice for honeymooners. 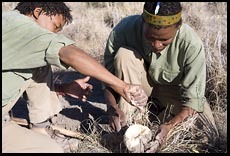 For everyone else, however, Jack's will instill a deeper appreciation for the Botswanan ecology, the skills of the Bushmen, and the knowledge of a dedicated guide. 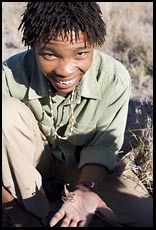 Jack's is one of the best places in the world to photograph meerkats. 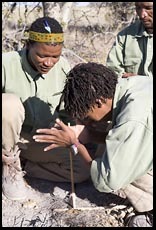 The Camp employs a full-time "meerkat follower" whose job is to live with the meerkats, camping next to them every night, and keep them accustomed to a human presence. You can get interesting photos with a lens as short as 14mm. 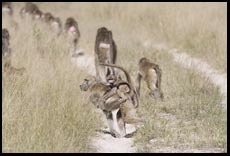 I got so many keepers that I created a separate page for my meerkat photos. 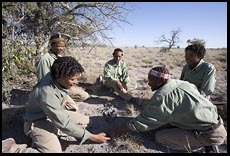 A rotating group of Bushmen live at the Camp, ready to take tourists out for a walk through the Kalahari where traditional survival skills are demonstrated. 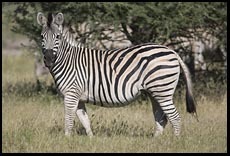 Zebra migrate through the area in such numbers that they create permanent tracks. 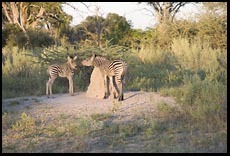 The dust kicked up is so thick that the animals close their eyes and follow each other by sound and smell. 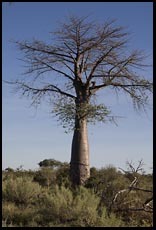 Baobab trees can be enormous (click to see the person, added for scale, in the middle of the tree) but they are difficult to date because they are "semi-succulents" and lack rings like true trees. 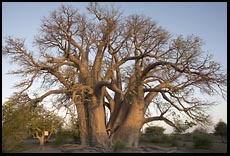 This is "Chapman's Baobab", perhaps more than 4,000 years old, and a landmark for early explorers such as Livingstone. Food at Jack's is simpler and tastier than at newer camps, where the grasp of ambitious chefs usually falls short of their reach. 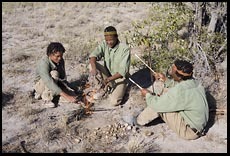 When ingredients have to be flown in by Cessna and the chef has to be kept entertained in the middle of nowhere, it is impossible to produce the kind of elaborate cuisine you'd find in the best restaurants of Cape Town. 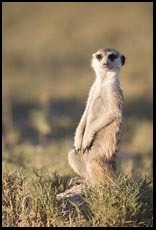 Meerkat at 200mm. 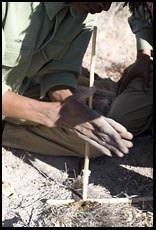 See the meerkat page for the rest of the photos. 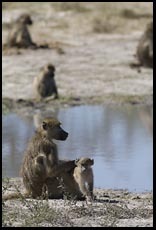 People come to Mombo to see interactions among species. When not viewing animals, guests are luxuriously catered to with 24-hour electric power, hot water bottles, cool face towels, etc. 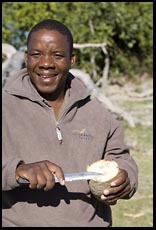 The cuisine is ambitious, always copious, and often excellent (try to limit your trips to the buffet, remembering that you will probably be less physically active at a game lodge than at nearly any other time of your life). 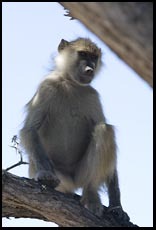 Caveats: Mombo is within a national park and therefore night drives are prohibited; this reduces your chance of seeing a kill. 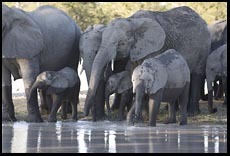 Mombo is perhaps the most expensive camp in Africa, which draws in a crowd of folks who may not be passionate about animals, photography, or Africa. For you, it is the trip of a lifetime; for them, it is a pleasant diversion for this particular month. 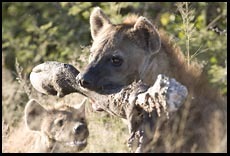 We were fortunate to see some young hyena waiting for their mother to return with a buffalo leg. 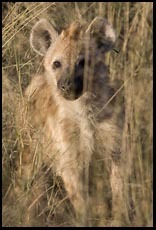 This hyena pup wasn't kind enough to step into the clear to be photographed. A moderately wide aperture of f/5.6 renders the interfering grass reasonably unsharp (might have been better to use the f/4 maximum aperture of the 300/4 lens). 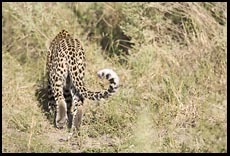 This is a good illustration of when it is necessary to use manual focus. 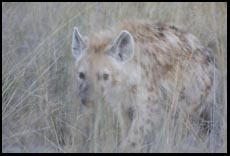 The camera's autofocus system would have done a great job... of focusing on the grass in the foreground. 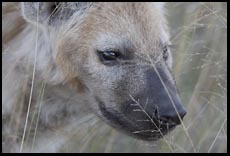 Unless you can find a camera with "hyena face detection", prepare to focus manually in this kind of situation. 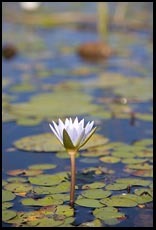 You're the photographer; only you know which part of the scene should be rendered in sharp focus. 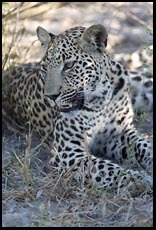 Mombo is a reliable place to see leopard, which do not run from a game drive vehicle. 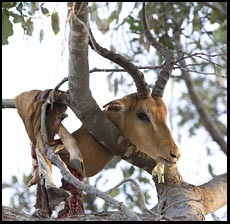 If you see an antelope head in a tree, that's not the result of a big jump, but rather part of a leopard's pantry. 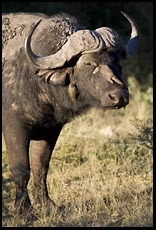 "They always look at you as though you owe them money," one guide observed about Cape Buffalo. 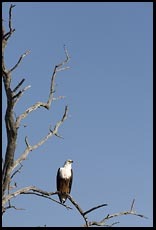 At 420mm, this Fish Eagle is quite small. 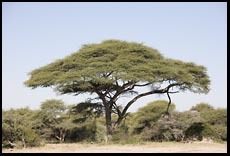 The dead tree adds more interest to the frame than empty blue sky and it is possible that this would be an effective image enlarged to 16x24". 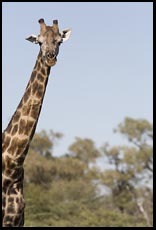 Giraffe are shy and tend to move away from an approaching vehicle at a deliberate pace. Don't linger with your composition. 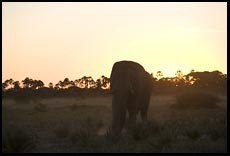 You would think that the time around sunset would yield the best images, but (1) at Mombo, you'll be racing back to camp to avoid the national park ban on driving after dark, (2) the sun sets quickly near the Equator, (3) animals may not look very interesting when backlit, and (4) there are seldom any clouds in the sky to add interest. 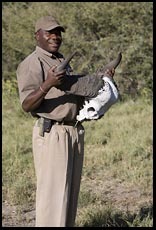 A handful of white rhino live at Mombo. Finding this one required directions from another guide and an hour of bumpy off-road driving. 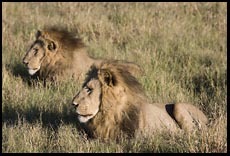 Mombo has its own pride of lions. 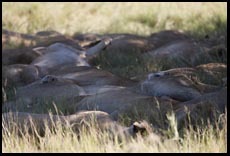 During the day, they lie around on the grass preparing for a Spencer Tunick photograph. 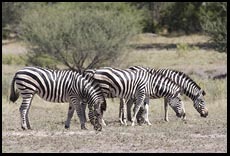 Vumbura offers more activities than the average game lodge: powerboat rides, mokoro (poled canoe) rides, walks with a rifle-toting guide, as well as the usual game drives before and after dark. 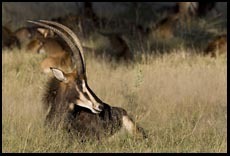 Vumbura is home to a large herd of the rare Sable Antelope as well as the usual animals of the Okavango Delta. 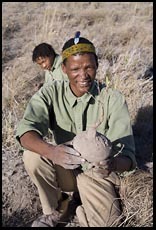 The lodge itself is one of the most modern and comfortable in Africa. Each guest room includes a sunken seating area with a sofa large enough for 10 people. 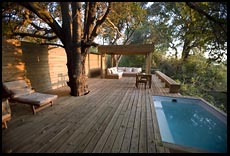 The patio includes a plunge pool, some chaise longues, and a shaded L-shaped sofa, also big enough for 10 people. You could easily host a party for 50 people within the private area of your room and deck. 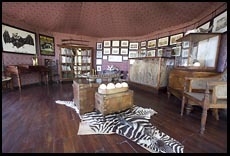 Given that Vumbura Plains only has eight rooms and a maximum of about 20 guests, you might have to fly some party guests in for the day. 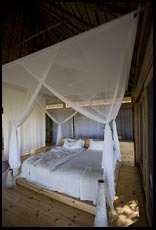 Due to the comfort and relaxed atmosphere, this would be a great lodge at which to start a honeymoon. 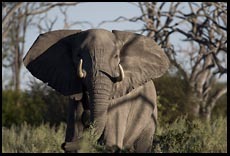 The elephant image at left illustrates the important photographic principle of "f/8 and be there". 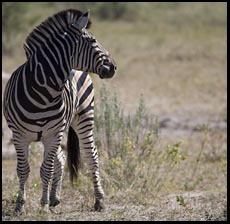 This was the first photo taken at Vumbura Plains, from the deck of the main lodge, with a fixed 50mm lens. 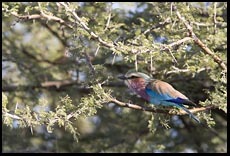 The image at right required a bit of a drive and a 300mm lens. 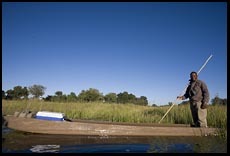 The Makoro ride was a perfect place to use the canon_16-35. 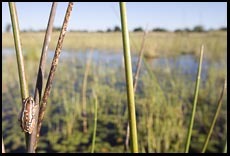 The tiny Painted Reed Frog in the image at left shows up fairly well in a full-size version. A macro lens would have been nice, but you can't get every photo on every trip. 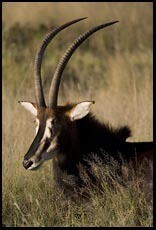 A Sable Antelope portrait, left, at 420mm, can be nice, but it is also good to capture the overall scene, right, at 130mm. 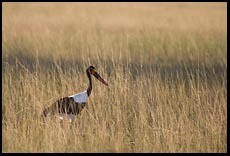 The Saddle-billed Stork is an enormous bird, by bird standards, but 420mm still isn't long enough to get a true portrait. 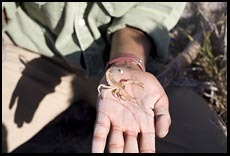 The BBC has elected to camp out here at Chitabe for the past three years, gathering material for various nature shows. 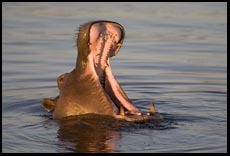 The area is rich with all kinds of animals and is an especially great place to photograph hippos. 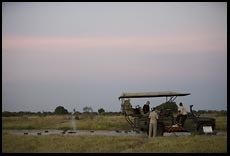 Arriving at the hippo-filled river at sunset was a magical experience for guests. It is tough to capture the magic, however, with straight overall photos such as these. 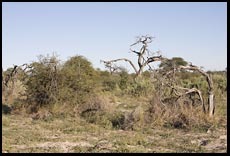 The telephoto close-up of one hippo at left makes a reasonably effective image, but it could have been taken in a zoo. 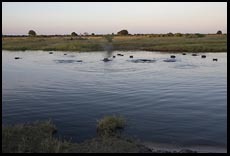 The cropped image at right (click to enlarge/appreciate) is better at communicating the extent to which the hippos were filling the river. 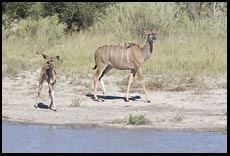 The longest lens in the bag, a 300/4 plus a 1.4X teleconverter, produced the boring "could have been taken in any zoo" image at left. 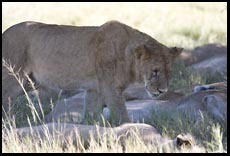 Removing the teleconverter shows the young male lion with his companion, at right, but we still haven't learned anything about Chitabe. 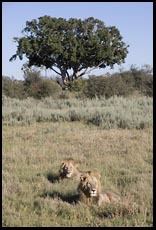 Going to a standard 70-200 zoom lens, set to 115mm, results in an image showing the lions and their lonely prey-free environment. 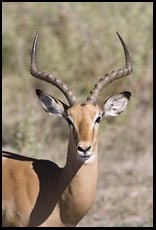 You may get tired of seeing impala, which the guides refer to as "leopard food". 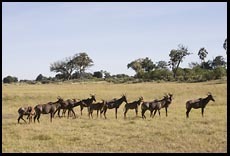 You will either see a handful of young males or a dominant male and his harem of up to 100 females. 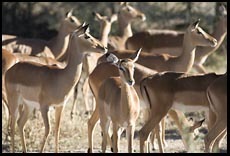 It is difficult to get an interesting image of these abundant antelope, which generally start to run away when a vehicle approaches. 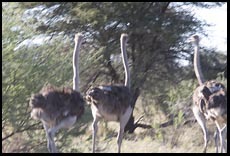 There are two kinds of Ostrich photos that you can take. 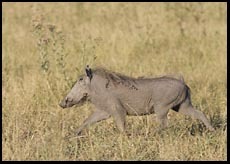 They will either be far away (left) or running away (right). 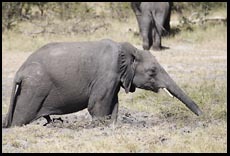 Do not invite elephants to a backyard barbecue. 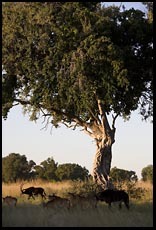 In addition to stomping and eating everything, elephants will strip bark from certain trees and knock others over to gain better access to tender young branches. 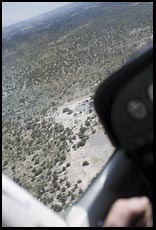 You will see game from the air taxi flights that go from lodge to lodge, but these generally fly too high for interesting aerial photos. 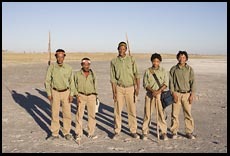 You can charter an airplane out of Maun to do a specific photo mission, but the windows and struts of the little Cessnas will get in the way and the pilots who work for the Botswanan air taxi companies are some of the least experienced commercial pilots in the world. You're much better off in a helicopter, though sadly the only machines available are expensive jet-powered machines that will start at $1000 per hour. If you do manage to get hold of one, you might find my aerial photogaphy tutorial helpful. However you book your trip, do it far in advance. 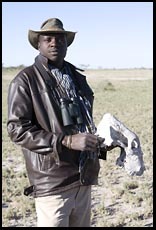 Roads are few and poor in Africa, making air travel essential. In an effort to protect small domestic carriers, governments set tight limits on air travel. The result is that flights are few, far between, and five times as expensive as in the U.S. or Europe. Even if you can get a place in a lodge, you might not be able to get there. 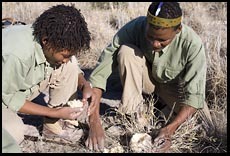 People typically book Africa trips six or nine months in advance. 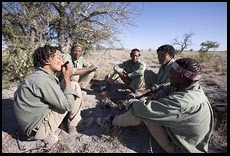 If you book last-minute, be prepared for some days cowering in a Jo'burg hotel room or bored in a dusty provincial Botswanan town. 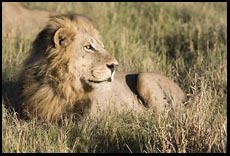 The easiest thing to do is what I did: contact James Weis at Eyes on Africa and let him book the entire trip. 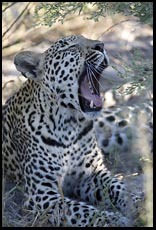 He is an experienced wildlife photographer and knows the lodges, the seasons, and the animals. 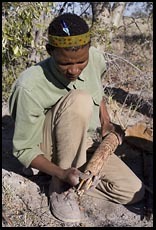 Botswana is tough to visit on a tight budget, but it can be done if you're willing to rough it. 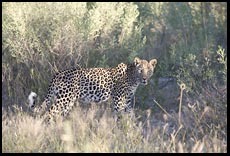 The easiest approach is the driving safari, in which tents are set up in a new location every night. 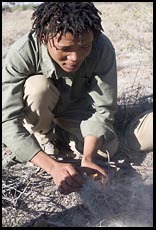 Check Lonely Planet Botswana and Namibia for the low-budget options. Text and pictures copyright 2007 Philip Greenspun All photos taken with a canon_eos5d, typically with a canon_300/4 lens.